In a tradition going back to 2008, we now present our annual review of award-winning short films over the past year. Listing the winners invariably results in a kind of Hit Parade of shorts. Naturally, no conclusions about the films’ artistic quality can be drawn from this sort of ranking, but it does indicate their popularity as measured by the votes of expert juries and viewing audiences. Ultimately these are market data stemming from the prevailing mood and subjective quality judgements. The data collected not only reveals the success of individual films but also provides information on the role played by their countries of origin, the various festival locations and the popularity of different film genres. The success of short film production in some countries versus others comes to light, for example, and cultural affinities between certain countries can be discerned. Ever since the first annual review of award-winners, I have been observing a trend for just a handful of short films worldwide to win the lion’s share of awards and distinctions. This is a demonstrable fact, but it is impossible to know for sure whether the imbalance says something about the quality of the films concerned or whether the decision-makers perhaps find themselves in a kind of echo chamber or filter bubble that influences their choices. Only the major, respected short film festivals with international competitions are registered here. Events with an exclusively national or regional focus are not included. We do however report on national film awards such as the German Short Film Award and the Césars in France. In 2018, prizes presented in nearly 60 countries were published on the website. We usually list only the main prizes, but for the larger festivals we also include honourable mentions. As a rule, only short film festivals are taken into account, with the exception of large international feature film festivals with a short film competition such as Cannes, Berlin and Sundance. Overall, we reported in 2018 on the jury decisions in 291 festivals or competitions – 57 of them in Germany. Due to our own geographical location, German as well as European festivals and competitions are over-represented. But the short films cited come from all continents and regions of the world. Of the awards published on our website in 2018, the most by far went to films made in Germany (187 awards), France (146), the USA (134), the UK (114), Spain (76) and Belgium (51). Co-productions are not included in these figures. The countries topping the list and the number of prizes have changed little in recent years – and even their order has remained the same since 2016. In terms of absolute numbers, though, France was less successful in 2018 (173 award-winners in 2017) and British films have caught up again after years of falling behind (84 winners in 2017). Of the total awards presented on the website, around half went to films from only nine countries. Among the smaller countries – in terms of population – 2018 was a banner year in particular for shorts from Switzerland and Belgium. Sometimes, standout films briefly catapult a country to the top of the list. Belgium, for example, was among the top ten in 2018 thanks to worldwide acclaim for WILDEBEEST by Nicolas Keppens & Mathias Phlips, SIMBIOSIS CARNAL by Rocío Álvarez and the co-production CE MAGNIFIQUE GÂTEAU! (This Magnificent Cake!) by Emma de Swaef & Marc James Roels. Sweden enjoyed a similar trajectory this past year, with just three films – MIN BÖRDA (The Burden), SKUGGDJUR (Shadow Animals) and SCHOOLYARD BLUES (Skolstartssorg) – sweeping up half of all awards for domestic productions. The prominence of certain countries among the prize-winners reflects not only their short film production volume but also of course the number of festivals there. As films have better chances of winning awards on their home turf, more festivals in a particular country mean more wins for domestic productions. Examples of this phenomenon are Germany, the USA, France and Spain, countries with a large number of short film festivals at which home-grown titles normally have better chances of success than foreign rivals. 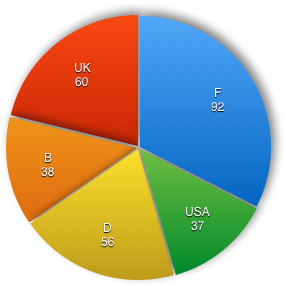 Likewise of interest are the figures indicating films’ success abroad. The following picture takes shape here: the greatest acclaim in foreign climes was reaped in 2018 by films from France (92 awards), the UK (60), Germany (56) and Belgium (38). As in 2017, films from France were once again the most successful internationally. US films by contrast did worse and those from Canada did better abroad than before. Among the countries that do not have a strong festival scene for the short form, the UK and the Netherlands enjoyed disproportionate success abroad in 2018 – as in previous years. Among the international award-winners were ENOUGH by Anna Mantzaris (UK) and LUISTER (Listen) by Astrid Bussink (NL). In 2018 – as in prior years – films from Brazil, Italy and Spain won substantially more awards at home than abroad. This goes for Germany as well, which is however a special case in our statistics, because the website lists the awards even at its smaller festivals, often with little international participation. German short films received 134 awards at home in 2018 (2017: 145) and showed a decline abroad, with 53 prizes (2017: 54; 2016: 58; 2015: 91). 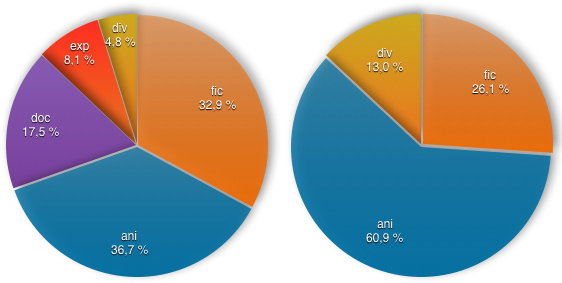 If co-productions are counted, however, the number rises to 69 awards abroad (thanks to WATU WOTE, D/Kenya!). The countries without a real short film festival scene whose films receive awards almost exclusively abroad include Russia, Romania and China. In Germany, the most decorated foreign short films in 2018 came from the UK (16 awards) and France (12). This continues a long-term trend. Films from the neighbouring countries the Netherlands (10), Austria (8) and Switzerland (6) also continued to enjoy critical acclaim in Germany. US films, on the other hand, declined in popularity (2 prizes compared to 8 the previous year). New in the race, with six prizes, were short films from India. French films received the most foreign awards in Germany (14), Italy (12), Japan (9) and Poland (7). And, as has been the case since 2013, British films were particularly successful in Germany (16 awards), the USA (8) and France (9). Notable is that German films conversely did not find much favour in the UK (2 awards). Besides enjoying great success at home (96 awards! ), films from the USA won raves across a broad range of countries, but most of all in France (6 awards), Japan (4) and Canada (3). Spanish films received the most foreign awards in Germany (4), Italy (3) and France (2) – as opposed to no fewer than 44 wins at home. Films from the South American countries in turn were most successful on their own continent, and otherwise received appreciable recognition only in Spain. And productions from the Nordic countries, besides their success at home, did the best abroad in France (9 awards), Germany (7) and Spain (5). German films for their part won a number of awards in 2018 in Italy (7), Spain (6), France (5), Portugal and Austria. The greatest share of prizes were handed out to foreign short films in 2018 in Japan, Poland, Italy, Portugal and France (in each case around 70% or more). In Germany, just over half of all awards were bestowed on foreign productions, while in previous years German films had carried the day. In Brazil, the UK and the USA, by contrast, domestic productions continued to reign supreme. The widest range of countries represented amongst the winners in competitions and at festivals can be found in Germany (40 different countries) and France (35), followed by the USA (33) and Spain (25). In total, the 2018 award-winners came from 86 different countries. The tendency toward greater internationalization witnessed over the last 10 years is thus stagnating in the meantime. In 2017 and 2016, the winning short films came from 88 different countries and in 2015 from 84. The most successful short of 2018 was the fiction film FAUVE by French-Canadian filmmaker Jérémy Comte – a tragic tale of two boys who try to outdo each other testing their mettle in an open-cast mine. According to its author, the film took part in more than 130 festivals and received more than 70 awards. FAUVE premiered at the Sundance Festival. Next in the ranking – as in 2017 – is the animated film MIN BÖRDA / THE BURDEN (S 2017). Director Niki Lindroth von Bahr calls her work a dark musical about longing, the burden of loneliness and the meaninglessness of the workaday world. Tying for third place in number of awards were EGG, SOG and NEGATIVE SPACE. The French-Danish co-production EGG (F/DK 2018) is an animated documentary. In this autobiographical account, Italian filmmaker Martina Scarpelli tells of how she conquered her anorexia. The film was made during an Anidox residency and co-produced by the enterprising distribution company Miyu, Paris. NEGATIVE SPACE (F 2017) is also distributed by Miyu. The stop-motion animation by US-Japanese filmmaker duo Max Porter and Ru Kuwahata, about a father-son relationship, was already second in the ranking last year. SOG (D 2017) by Jonatan Schwenk was likewise among the favourites last year. In this bleak animated film, a school of fish gets caught in the branches of trees after a storm surge. In fourth place is WEEKENDS (USA 2017) by Canadian filmmaker Trevor Jimenez. The 2D animated film, which was made with support from Pixar, tells the story of a boy suffering through his parents’ divorce in Toronto in the 1980s, incorporating autobiographical elements. Sharing fifth place in the ranking are the animated film SOLAR WALK by Réka Bucsi (DK 2018), the fiction short MADRE by Rodrigo Sorogoyen (ECAM, ES 2016), the animated film CE MAGNIFIQUE GÂTEAU! (This Magnificent Cake!) by Emma de Swaef & Marc James Roels (B/F/NL 2018), the animated film MASCARPONE by Jonas Riemer (Film University Babelsberg 2018) and the fiction short RETOUCH by Kaveh Mazaheri (Iran 2017). Five German films and co-productions were among the films winning more than four awards in 2018 (the same number as 2017). In addition to the aforementioned films SOG and MASCARPONE at the top and WATU WOTE (since 2016), new and successful shorts in 2018 were the animated film OBON by André Hörmann & Anna Bergmann, the animated documentary TRACING ADDAI by Esther Niemeier (6 prizes and one Student Oscar nomination), NEKO NI HI (Cat Days) by Jon Frickey and the animated film AMEISE (Ant) by Julia Ocker (5 prizes), who was also recognised in 2018 for LÖWE (Lion) and PINGUIN (Penguin) – from the same children’s film series from Studio Film Bilder. A total of nearly 179 audience awards were cited on our website. Just as in the years before 2017, the audience and the expert juries were more or less of one mind with their choices; of the top ten shorts chosen by juries, only FAUVE, EGG and SOLAR WALK failed to take home any audience awards. The most popular shorts of 2018 were the British animated film ENOUGH and WATU WOTE, which already led the list of audience favourites in 2017. MIN BÖRDA and NEGATIVE SPACE followed, films that have also received plaudits from expert juries over the past two years. The great majority of audience awards were however scattered amongst a large number of films, with 179 prizes presented to no less than 162 different titles. Granted, it is quite difficult to distinguish between film categories and genres nowadays, as many films have a hybrid character. We do have some data available, however, since most festivals still ask those submitting films to choose between the classic categories. With the caveat that we are lacking this information for one sixth (288) of the prizes registered on our website, an overall evaluation of the remainder paints a clear picture: 529 awards for fiction films, 474 for animated films and 252 for documentaries. With 118 winners, experimental film, a particularly questionable classification, accounted in 2018 for the first time for more than 100 prizes. 47 awards went to films in the category “other” (most of them music videos). New in recent years is the steadily increasing number of hybrid forms. In 2018 there were 24 winners here, most of them “ani-docs” – as well as ani/exp, which is to be expected, but also increasingly fiction in combination with 3D animation. What is difficult to understand is why the 23 shorts that received more than five awards included 2 ani-docs but not a single classic documentary. With 14 top-ranked titles, animated films are once again represented disproportionately. Six are fiction films and three have a hybrid form. As in previous years, winning an award at one of the major film festivals was seldom a herald of further success at short film festivals. Shorts that won in Rotterdam, Locarno or Venice rarely appear again anywhere on our list. But there were a few notable exceptions in 2018. The film with the most awards in 2018, FAUVE (see above), had its premiere at Sundance. And of the four winners at the Berlinale Shorts, the Audi Short Film Award selection SOLAR WALK by Réka Bucsi went on to enjoy great success. INANIMATE by Lucia Bulgheroni (Troisième Prix Cinefondation) and ALL THESE CREATURES by Charles Williams (Palme d’Or), both among our top 20, got their start in Cannes. Award accumulation – the result of echo-chambers? We already noticed back in our first annual awards review (in 2008) that the distribution pyramid for short film prizes tended to taper off considerably toward the top. In 2009, a small group of 15 films received more than four awards each. 2017 showed a similar pattern, with 24 films accumulating more than four prizes each, thus accounting for 10% of all prizes registered that year. In 2018, 27 films received more than four awards each and thus swept up 189 of the year’s prizes. 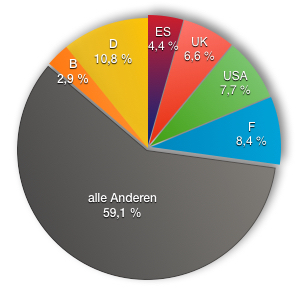 This means that around only 2% of the winners received 11% of all awards registered on the website. And, conversely, 1,026 of a total of 1,270 award-winning films in 2018 received only a single prize. We can therefore conclude that the distribution pyramid has become somewhat broader at the base compared to 2017, but the peak has for that matter become even narrower. It is hard to understand how juries at 300 different festivals in 60 different countries, each with different jurors from different cultural areas, can manage to agree on a mere two dozen films. Considering the estimated 10,000 shorts submitted to festivals worldwide each year, it’s a wonder that just a few films are always voted the best by a wide margin. In 2018 there were unfortunately hardly any new big winners: half of the top ten titles were already at the top of the prize pyramid in 2017. Echo chambers caused by algorithms, as happens on the internet, cannot actually exist in real life. It can hardly be presumed that agencies, which do in fact acquire films using algorithms and then flood festivals with submissions, already exercise so much influence that the very same films are accepted to competitions everywhere. Perhaps this phenomenon is due more to a network of curators and other influencers who act as taste-makers. But this is of course mere speculation. One might also surmise that the sheer number of films means that nary a festival can manage to preview and seriously discuss them all. It might then be easier to make a pre-selection based on what happened at the other festivals – with the result that fewer and fewer films end up making the rounds through more and more festivals. One thing is for certain, though: this is not what diversity looks like! Postscript: Disclaimer 😉 After we post these annual statistics online, we sometimes receive letters from filmmakers telling us they have received more awards than the ones mentioned here. This is no doubt correct if one takes into account all competitions and festivals worldwide, including smaller regional events. The selection of festivals evaluated here is however limited in terms of quality and quantity. The criteria are openly disclosed in the introduction above. These are the same festivals that are listed in the monthly Festival Calendar on the website. If any important short film festivals are missing there, please let us know! I shoot selfies, therefore I am! Which Funding and Support Does Short Film Need?